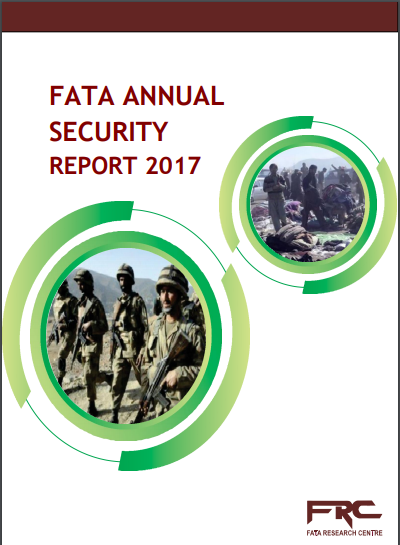 The security situation in FATA remained volatile from January to December of the year 2017. Although targeted and intelligence based operations (IBOs) continued all over FATA, terrorist belonging to the Tehreek-e-Taliban Pakistan (TTP), Tehreek-e-Taliban Pakistan-Jamat-ul-Ahrar (TTP-JuA), Wazir Taliban, Islamic State of Khorasan (IS-K), Laskhar-e-Jhangvi (LeJ) stepped up their activities in FATA during the reporting year. However, the ratio of counter terrorism (CT) operations remained higher in comparison to the terrorist attacks during the year 2017. A total of 325 violent incidents (153 terrorism and 172 counter-terrorism) incidents were recorded during the year 2017 compared to 219 (131 terrorism and 88 counter terrorism incidents in 2016. This shows an increase of 16 percent in terrorism incidents while 49 percent in counter terrorism incidents in 2017 as compared to the previous year. The violent incidents both terrorist and counter-terrorist, resulted in a total of 1207 casualties – 539 killed and 668 injured – across FATA, marking an increase of 37 percent in overall casualties. The following graphs provide an overview of these casualties. Civilians remained the main target of terrorist organization during the year 2017. Of the total casualties, 76O (138 Killed and 437 Injured) were that of civilians, accounting for 63 percent of the overall casualties. 128 casualties (63 Killed and 65 Injured) were inflicted upon security forces which makes 11 percent of the overall casualties. Similarly, 29 casualties (11 Killed and 18 Injured) of civil militia were also reported during the year 2017.